Your garage door uses a spring system in order to operate. These components belong to one of two types – torsion and extension. Both of these types are incredibly dangerous, however they work quite differently. When something goes wrong with them, you need to have a professional take care of the issue before somebody gets hurt. That's what our technicians are here to do. Extension springs operate by stretching and contracting in order to help your door move. They are installed in pairs, one on each side of the panels, and are usually interlaced with safety cables that prevent them from whipping around when they break. Torsion springs are installed horizontally above the panels, and they (plural here, although usually only one is used) twist and unwind, effectively using torque, in order to help the door open and close. 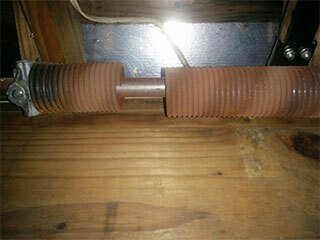 While both of these types are dangerous, torsion springs are usually considered to be less so. The nature of their build and action makes them less likely to go flying when they snap. Even still, these components support the full weight of your door, and can cause it to slam shut and even collapse when something goes wrong. Galvanized and oil tempered springs have become quite common today, as these types of zinc coated and heat treated varieties have been proven to be more reliable and stronger. Spring lubrication and adjustment is one of the touchstones of our regular maintenance services. We make sure these component aren't overstraining themselves and that your door doesn't get out of balance by making sure their tension is properly distributed and that their coils are able to work as efficiently as possible. Of course, that's all well and good, but when a spring breaks, you can always rely on our team to get to you quickly and replace it on the spot without risking anyone's safety. Remember, garage door springs are incredibly dangerous and should never be handled by an amateur. When you suspect something is wrong, or if you know it for a certainty, give our experts at Garage Door Repair Waxahachie a call ASAP.